DME Counterbores are hardened and precision ground from top quality high speed steel to give you cleaner cutting and longer life. 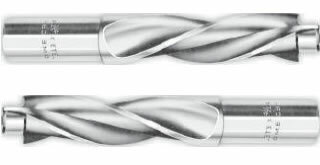 The three-ﬂute spiral design has been engineered to reduce tool wear and give faster cutting action through rapid chip clearance. 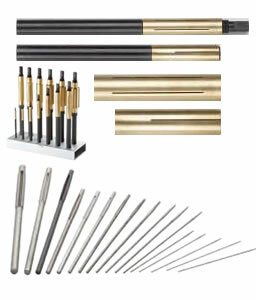 DME Machine Reamers are made of top quality High Speed Steel and are especially effective for use in materials which are ordinarily difﬁcult to ream. The right-hand spiral and right-hand cut design gives them a free cutting action resulting in smooth, accurate holes. 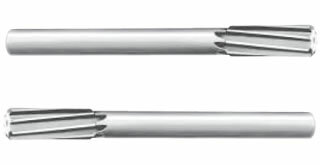 For those moulds that require deeper holes for hot runner and mould components, DME Straight Shank Long Drills are available in overall lengths of 20 and 24 inches, with respective ﬂute lengths of 16 and 24 inches. The product’s parabolic ﬂute geometry produces lower chip-evacuation forces than standard ﬂute geometry and a 30 percent increase in depth. DME also supplies Sprue Bushing Reamers for roughing and finishing. DME Flexolaps are instantly and accurately adjustable for fast cutting and polishing. DME branches carry all the sizes listed below in stock for immediate delivery in either the barrel or blind-hole style. The longer cylindrical lapping surface and easy adjustment insure greater precision and longer life. DME Midget Laps are ideal for accuracy in lapping small holes from .032” to approximately .250”. This complete range is covered by seventeen different sizes and each lap expands to the next larger size. The Midget Lap has an elongated slit like the eye of a needle. With the Lap Expander any desired degree of expansion is quickly and easily obtained. This enables you to have complete ﬂexibility without the danger of seizing.